Dates: August 9, 10, 11, 12, 18, 19 Year : 2018. Dimensions: Wall A= 9m x 2m, Wall B= 8.3m x 2.4m, Wall C = 15m x 0.8m, Wall D=1.85m x 0.8m. When I was first asked to do this, I felt compelled to do it cos I am first and foremost, a mother and knows how parents feel when a child has such special needs. I went down and saw the wall and decided to do not one, but continue onto the next and realised there are actually three and a half walls in total -- the second runs continuously toward the smaller road which leads to the entrance of the building. Both brother and sister wanted to open another venue for parents and their children providing them with therapy, help the child be trained, get an education as they could not fit into the 'normal' schools and eventually, be able to fend for themselves when they become adults. As there are not many such private institutions where there are experienced teachers, the opening of this school speaks volumes of the want and necessity. I do not have the figures of how many children there are in Singapore but I really wanted to do my part this way and as best as I know how. Besides children, he also rescued two abandoned dogs and an old retired police dog. Hence their faces on the third wall. I chose images that are endearing and display a mother's deep love for her child regardless...their love is truly unconditional. These are images that speak and shout of Hope, Support and Perseverance, and never ending Love. The owner's love for the dogs is unconditional, and so is a parent's love for their child. This wall has many metaphors that are meaningful to the owner as well as me. There are just too many things that happened during the days that seem miraculous, unexplained and not mere coincidences. As you browse the pictures, you will see what I mean...Below are a few and they are not in order of occurrences...Not sure if they can be considered as miracles but it's just the timing too for some of these happenings that seem to fall into place and somehow looks as if it's meant to be...The coming together of all into these 5 and a half days! Hard to believe but true and I had to quickly put these down to words before I forget. 1 - Good, fine weather with no rain throughout the 5.5 days from Aug 9-19 except that it rained for just 10 mins on Aug 18 and I was praying to the One up there to hold it till after the project. On the last day, August 19 - it started to rain only AFTER we finished in the early evening. 2 - Samaritan #1 - Mr Lee, the contractor who provided the big umbrella as shelter cos the sun is just too hot and I nearly got sun burnt in both shoulders. It's hard to view the references under the hot sun too. 3. Samaritan #2 - Karen -- one of many friends I made -- who bought us cooling drinks and snacks which serve as a good respite for a short while. 4 - This building sits right smack at the cross road giving it lots of attention and exposure to the public and traffic. 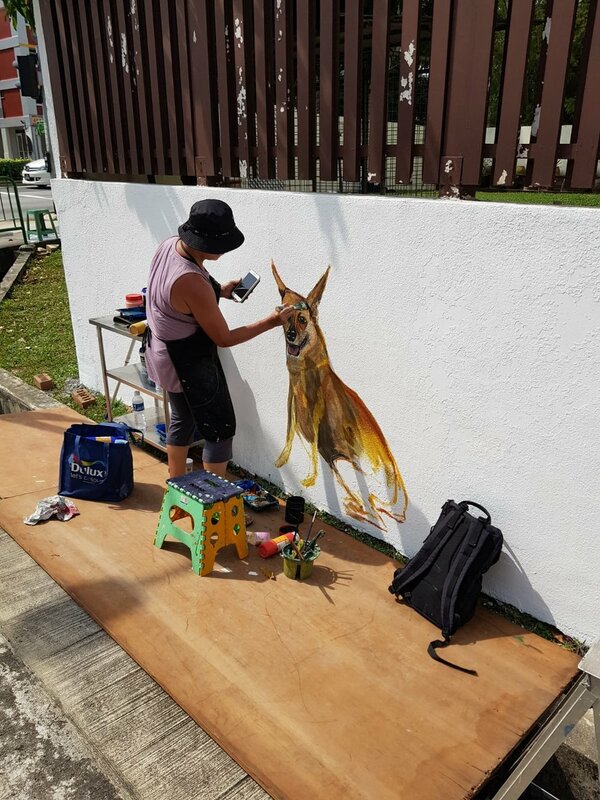 Each time I paint on the first wall, I hear cars honking asking those in front to move cos it's really a traffic stopper seeing me in action! 5 - The timing of the Chinese program 'Morning Express' coincided with the commencement of this project and the crew came down and started filming for three days. 6 - One of the ladies who walked by on Sunday morning happened to have the same Chinese name as my sister Poh Gek and what's funny is she has the same Chinese name as me ie. Poh Choo! Now how often do you get this type of coincidences? 7 - Brandon's ex-colleague lives a few houses away and Lawrence, her father came by and talked to us earlier. It's been some time since they kept in touch! 8 - On Day 1 - there is this lady who came and bought us and the crew egg tarts! 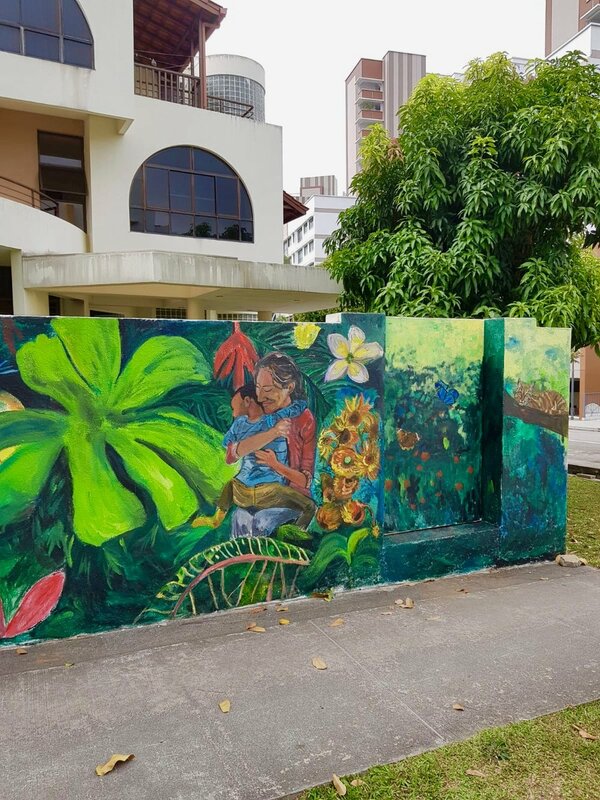 There was a feeling of community or kampung feel as the people gathered around and created a buzz as this is probably the first time they encountered a mural. She is known as the 'egg-tart' lady. We met her again on Day 2 and 3 again as she was passing by. She said she had to stop by the wall each time she walks by. 9 - Day 1 - the first passerby was interviewed by the crew as she was appreciating the work on the tree on second wall. 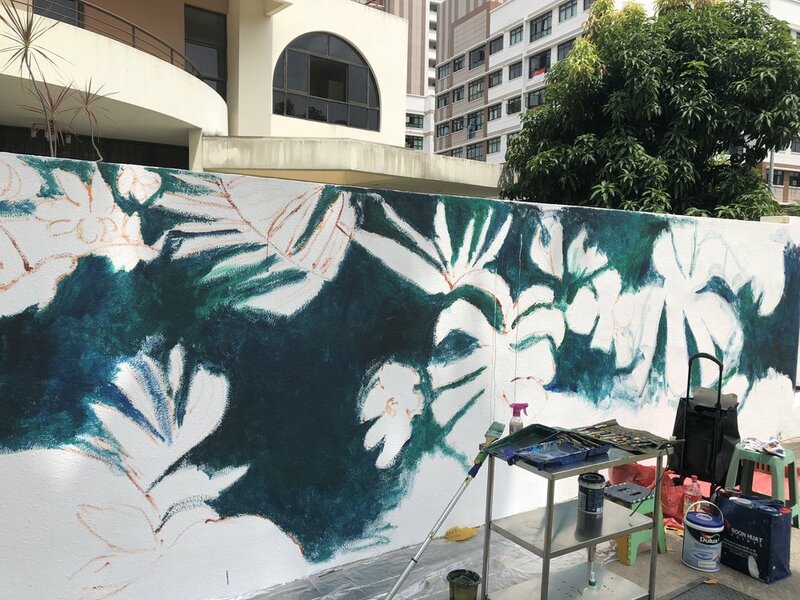 I was inspired to paint the leaves downwards from the tree which is believed to be a mango tree (but no fruits). I was wondering what to add on the wall and as I looked up, it seemed the leaves were talking and telling me to paint them! Wisdom from above! 10 - Sunflowers were also ad hoc and painted there and then giving a message of Hope. Hope for him, for them, for me, for all of us... It was also Vincent Van Gogh's favourite flower and yellow was also his fav color. There are hints of impressionism here featuring his works. I also subtlely added swirls to the clouds. 12 - Samaritan I#3 - Brandon Liu owner of Autism21 - he made sure I had enough water to hydrate and constantly checked on me and also assisted with the washing of the brushes, filling of paint onto the palette, etc. He also transported me on the first day with all that paint, and even provided lunch. 13 - Meeting Heizi the German Shepherd who was brought over and seeing him up close made me felt a bit emotional as I tell myself that even for animals, they do have feelings and they feel the pain of old age. Likewise for humans, we grow old too and he is fortunate to have his owner take care of him. When I first saw him on the floor, I was awed by this beautiful animal. 14 - This Indian art teacher whose son is ADHD and was walking by and she remarked she could use this place for such kids too. 15 - Last but not least, I was amazed that I was able to accomplish this within a week! I thought at first with two walls, I estimated to finish in two days and with 3.5 long walls, it stretched a little longer than targeted. I am grateful for health, strength, support from all, and wisdom! 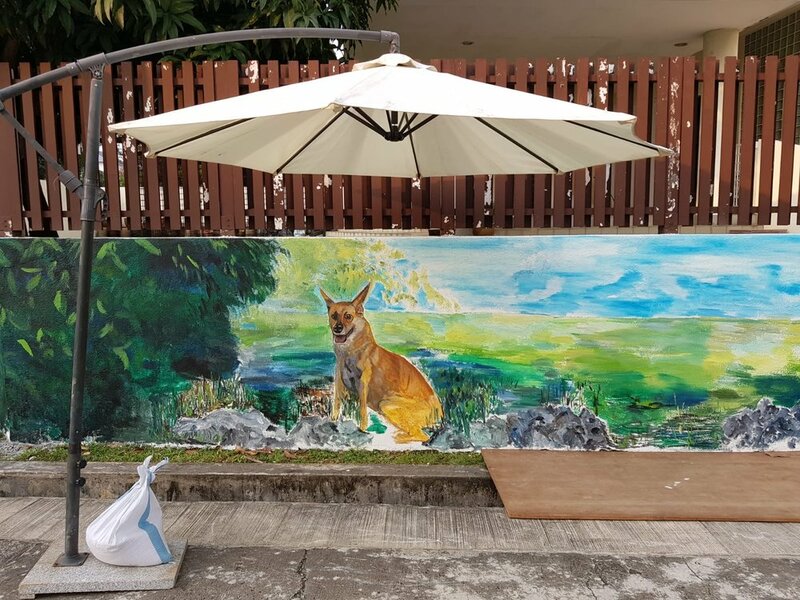 I hope the viewer will feel the same way and a sense of not only a mother's love but love for all including animals too from this work and their hearts touched. I trust this brings them back to the time when they were young and when their parents were still around. And for those whose parents (and pets and those dear to them) are still around, treasure them and spend time with them whenever and wherever you are. We never know how much we missed them until they passed on. Life is indeed fleeting and another message from the wall is to always remember to express our love to our family members not only in action but in words too. Much love and peace to all families. The filming begins! They came very early to my place around 6 am and started filming all the way through till mid afternoon. A closer look of a sketch of the first wall. After outlining and before the colours are added. Adding another mother and child on the first wall. This was ad hoc and not intended but because the wall is long that I had to populate it more besides just flowers and plants. A lot of thought were put into plotting the images, and composition and positioning of the images. Some had to be corrected and retouched. This is how the thought and inspiration flows when you are at the site! Where the door is, added the butterflies. From another angle to include the butterflies and the cat. 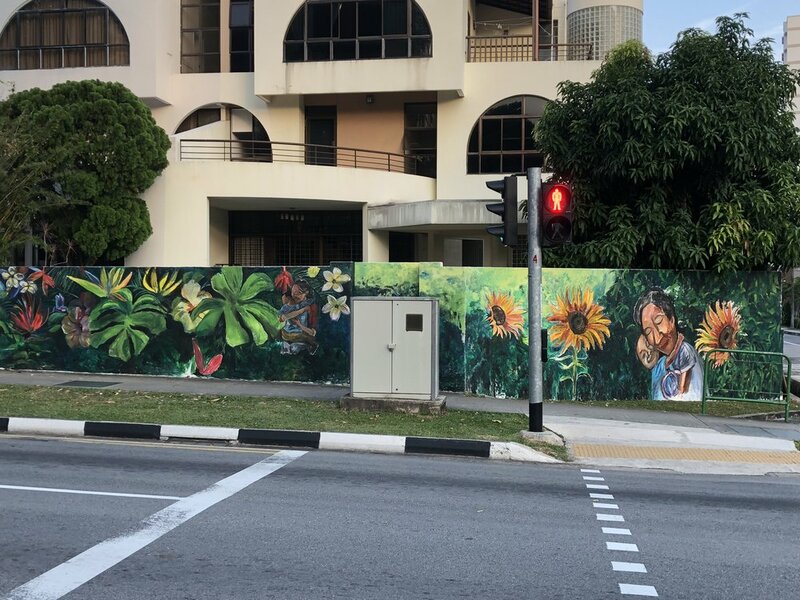 A touch of Van Gogh (since 2013 at MacPherson). The ladies I met on Sunday morning - Poh Gek is third from the left. Her Chinese name is the same as my sister's, and her sister's Chinese name is the same as mine! She is also inspired to take up drawing/sketching. For cat / feline lovers -- The cat was added. Karen who is inspired to take up the brush! It was nice to be appreciated by passers-by like this lady who lived around the corner. Art, like music, brings people together! 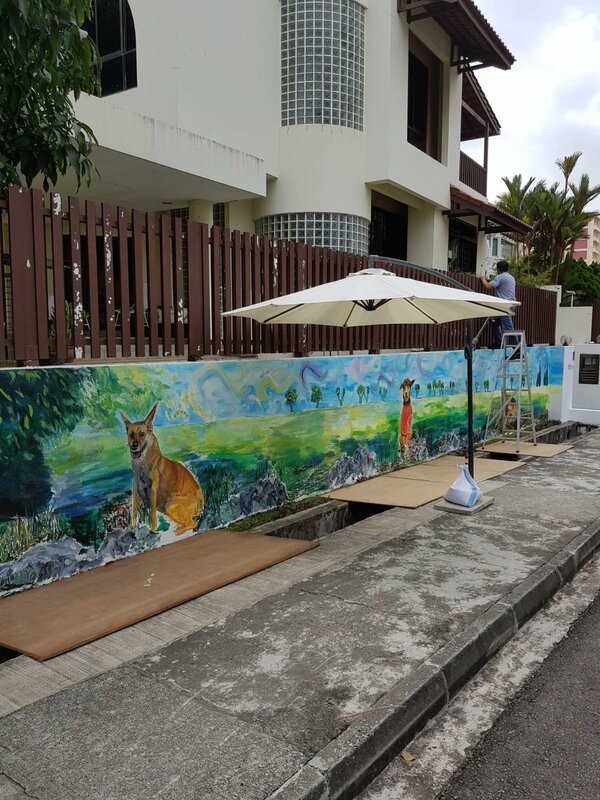 Must add the cat in all my walls...And this time, also the butterflies fluttering around..
Wall 2 - The owner and partner of Threesixzero Productions came down personally came down to see the progress. Mother and child done. well almost but because of time contraint, I had to do a quick draft first and move on to the next image. Filming continues each time I paint something new. Next is the sunflower. 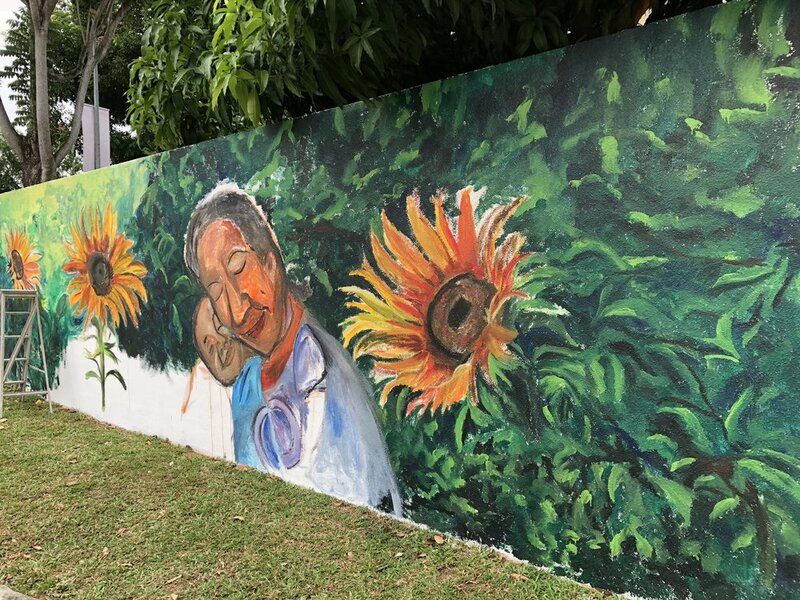 After sketching the faces and the sunflowers, I was thinking what to add to the wall. As I looked up, it seemed the leaves were asking to be painted. Viola! Hints of Van Gogh on second wall as well. 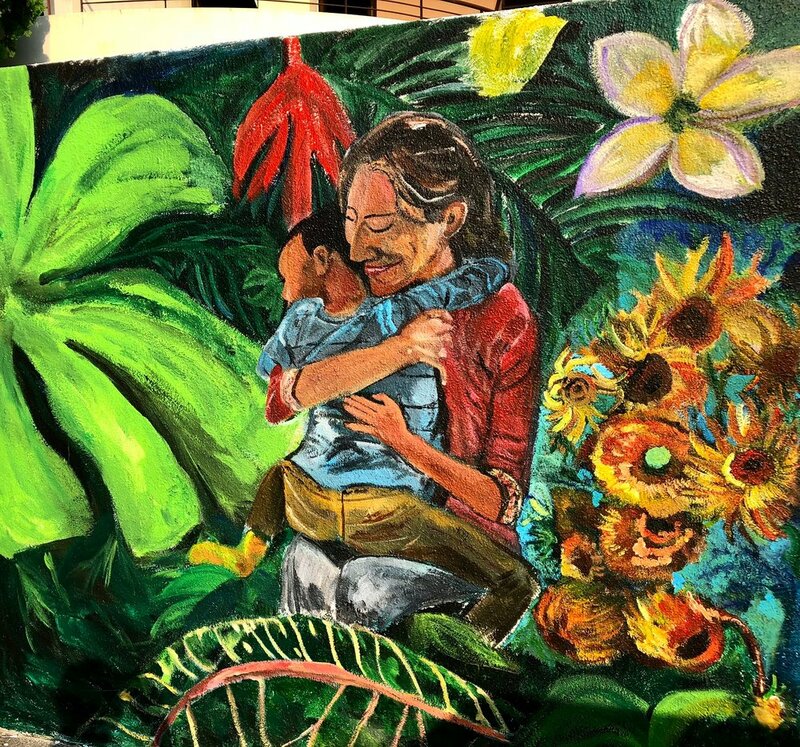 Sunflowers signify Hope and they face the parent and the child here. I only added the sound of 3 in Cantonese means Life. To give this child a chance in Life. Smaller sunflowers were added on Day 5 to complement the Big ones. Day 2 - Filming continues - I had to skip and start drawing the dogs. It was a sunny day and it gets really hot around noon. Mr Lee, the kind contractor donated this lovely umbrella to shield not only me but the dog it seems! Miracle one - Umbrella provided by a Samaritan. It got moved around each time I inch to another spot. Missing the French landscape and so I was inspired to add the cypresses. VG added these in his paintings as he saw beauty in such in nature. Miracle No. 2 - Samaritan Karen whose bubbly and happy-go-lucky personality makes us smile on a hot day! She brought drinks and cooking snacks for us on Day 2. The handsome guy who took the wife is none other than Brandon who is the overlooking the operations of the therapy centre. Thankful also to Mr Lee the contractor for providing the planks to stand on as there is no solid ground at Wall 3! I fell into the drain while standing on something that's made of mesh and not stable but luckily the drain was not deep! But I still prefer Emma followed by Heizi and Dobbie...while Mr Lee stood by Heizi. Samaritan Mr Lee standing by his favourite dog, Heizi (a German Shepherd from China). The name means Black Child in Chinese. Heizi was the first batch of dogs from China sent here for training. They only service for like 5 years after which they are up for adoption or euthanised! But Heizi is 13 dog years and that makes him a grandpa now ie. 91 human years old. He had to wear diapers, had bad arthritis and could not walk well. Hence he is always lying down and we just do not know for how long he is going to be around so the owner Brandon continues to spend time with him while he can. With the cat for company, they won't be so lonely...Batawi as I have called christened it the mascot of Lorong Batawi. Batawi was former name of Batavia the colonial name of Jakarta. Betawi people are an Austonesian ethnic group native to the city of Jakarta. After the planks were removed and when I went back to touch up, I had to stand in the drain to do the job. I have learnt a lesson well that when the drain is not deep, you don’t need a plank! Images of the three walls taken during sunset. Photo credit - Chiou Niing. Here's really looking at you! A closer look at BATAWI. 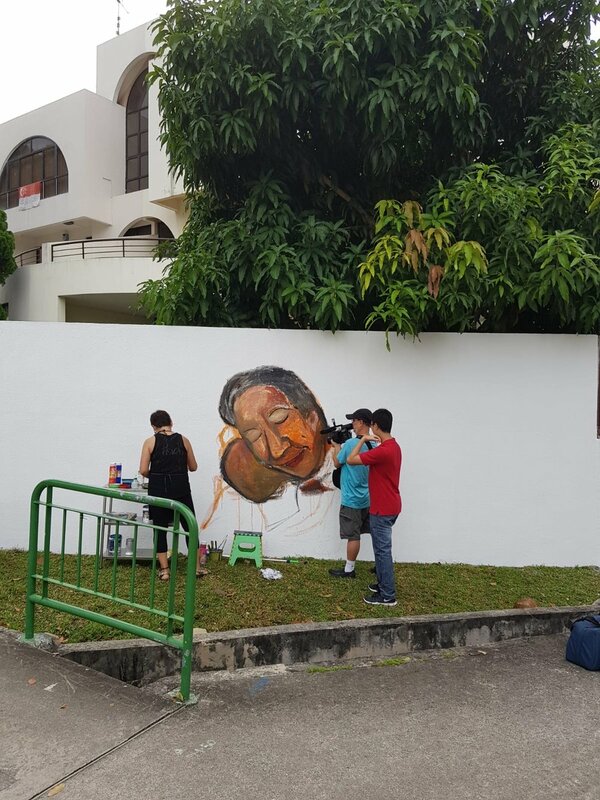 I just love painting them on walls where the public can interact with them as they pass by. Note the texture created by the wall.